Security continues to be an important factor in plant ops. Measures processors intend to implement include enhanced employee identification, increased surveillance, security application software and "big scary dogs and guys with guns." Last year was a tough year for everyone. To say things "got Biblical" would hardly be an exaggeration. We have a largely religious war in the Middle East, poverty and pestilence in Africa, floods and hurricanes at home and earthquakes in the Himalayas. Although there's no doubt a food manufacturer might have difficulty covering an increase in the price of plastic packaging or finding a trained line worker who'll stay on the job for more than a few months, we did feel the effects of the year's extraordinary global tribulations. Business advisory firm Grant Thornton LLP (www.grantthornton.com), Chicago, found in a mid-year survey the industry was anticipating good growth. But later in the year, hurricanes Katrina and Rita and unpredictable energy costs disrupted many facets of U.S. business. According to the firm's research, two-thirds of large-company executives expected negative effects from the storms for three to 12 months. "The food and beverage industry is highly reliant upon transportation to move goods to markets, and is especially sensitive to fuel and energy pricing from an operations component and due to the fallout that fuel pricing has on consumer spending," noted Jim Maurer, managing partner for Grant Thornton's Consumer & Industrial Products practice. The human cost of the tragedies of Katrina and Rita here or Pakistan and Iraq "over there" can't be underestimated. Yet they do have a trickle-down effect that can't be ignored. For example, fuel shortages lead to more than higher shipping costs. They also put strain on the ingredient supply chain, moving perishables expediently and the costs of goods and packaging along the entire chain from processor to consumer. A virtual three-way tie for second place was led by energy sourcing and costs (18 percent), automation (15 percent) and labor issues (14 percent). Other manufacturer priorities for 2006 included consolidation challenges (7 percent) and logistics (5 percent). One respondent mentioned packaging design as a top priority. Surprisingly, physical plant security came in at a meager 2 percent, considerably lower than last year, although in a subsequent question bioterrorism and other terrorism issues have more than 85 percent of respondents worried. Between Osama bin Laden and sneaky competitors, security continues to be an important factor in plant ops. About two-thirds of processors polled implemented additional security measures last year, and more than half will this year. Old fashioned lock-and-key mentality is the way most processors - 76 percent - intend to beef up security. And eyes-open techniques also come into play, with 65 percent bettering employee identification and 54 percent relying on increased surveillance. Big Brother will not only be watching you, but will be watching out for you. Add in security application software and, a category favorite, "big scary dogs and guys with guns" and hopefully our food plants will be fairly well protected in '06. 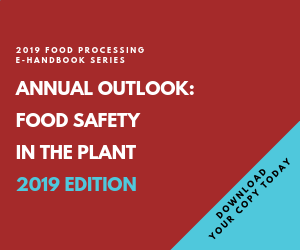 Of the 30 percent of respondents placing safety as their main manufacturing concern for 2006, nearly eight in 10 claimed to have implemented additional food safety measures in 2005. Almost as many - 69 percent -reported they will implement additional measures this year. Most of these measures (more than 88 percent) will take the form of employee training. Also in the works are plans to improve hazards analysis and critical control points (HACCP) programs (59 percent), better pest control (44 percent), equipment sanitation (39 percent) and rapid microbial detection systems (23 percent). Track and trace systems, third-party audits and increased worker accountability also were mentioned. "Our facility team leaders place safety and regulatory affairs at a high priority level," says John Loftis, regulatory affairs and food safety coordinator for commissary and related markets for Whole Foods Market stores in Georgia and the Carolinas. Loftis, whose division manufactures, produces, packages and ships prepared and ready-to-eat foods, came to Whole Foods following more than 32 years at the USDA in food safety. "I've probably seen or heard of anything anyone could have done or imagined in regard to food safety," he says. Recognizing how integral people are to the safety and security equation, Loftis continues, "Food manufacturing owners and operators should include, and seek advice and recommendations from, production, sanitation and quality control personnel before making major changes. Sanitation, production and quality-control education need to be raised to a higher level. All food manufacturing owners and operators also need to establish more uniform guidelines on bonuses and pay raises, with salaries increased according to training and experience levels." How to control for allergens? More than half (53 percent) are opting for improved washdown/clean in place and nearly one-fourth are devoting dedicated lines. From the other direction, 38 percent are going to improved labeling. For food safety and allergen control, as well as overall security, track and trace is important. It comes as no surprise, then, that more than three-quarters of respondents have such a program in place. Other solutions include timing operations so that allergenic ingredients are processed only at the end of the day or on a dedicated day of the week. Whether due to dedication or plain old fear of litigation, one manufacturer is taking allergen control to an extreme: "[We] plan to move our nut production to an isolated area outside the main plant." In light of the tragedy of the aforementioned teen, this might not be a bad idea. Even immediate countermeasures (an epinephrine injection) and rapid medical intervention failed to save the girl from succumbing to this secondary contact with peanuts. Energy placed second in this year's survey, moving up from fifth place last year. Labor, last year's second place, dropped to fourth, and automation, although still in third place, came in within little more than a point on labor issues (15 and 14 percent, respectively). Energy could have been more of a concern than it was. Oil prices doubling over the past year meant across-the-board impact on costs of manufacturing, packaging and shipping. While this may have netted Exxon-Mobil humongous jumps in profit, the jump in importance to manufacturers from last year's survey was just 2 percentage points (we expected more). Our fifth annual Manufacturing Trends Survey was an e-mail survey taken during the month of November. There were 465 respondents in the following food categories: bakery (11 percent), beverages (9 percent), confectionery (4 percent), dairy (7 percent), fruits and vegetables (6 percent), frozen products (5 percent), further-processed foods and specialties (8 percent), meats and poultry (14 percent), snack foods (4 percent) and companies producing several of these product types in equal amounts, or making other products, comprised the remaining 32 percent. Included within these groups, 48 percent manufacture at least some type of wellness food. This was probably just a case of "We thought things were bad last year, but…" because nearly 97 percent of respondents were at least somewhat worried about the high price of energy and 87 percent claimed to have been moderately to severely impacted by the leap in costs. One can only confess curiosity over the 3.2 percent who claimed to be "not worried at all" about energy costs. So how is energy management to be approached? With more than two-thirds of manufacturers taking steps in energy conservation, energy audits (33 percent) will be used as a control with recycling/redirecting energy and seeking alternate energy sources (such as biogas) making up almost another third. Co-generation and inside-the-fence generation complete much of the remaining picture at about 12 percent. Beginning last year, production edged out packaging when it comes to automation. The margin is still narrow, but this year's 3 percent gap is twice as wide as last year's. Fewer than 6 percent of manufacturers surveyed have their entire plant automated. The best news this year is that - in spite of safety and energy concerns plus economic woes - more than three-quarters of manufacturers plan on expanding production this year. About 77 percent -- a 10 percent increase over last year's survey -- anticipate production increases of at least 5 percent, with figures divided somewhat evenly among increases of 5, 10 and 20 percent ore more. Twelve percent will consolidate, while 24 percent foresee a flat year. The above translates into prospective capital spending figure increases for nearly 40 percent of companies responding. Another third will try to maintain status quo and less than 10 percent intend to reduce capital spending. One soup manufacturing facility in Washington state expects to increase capital spending by more than 10 percent to cover a planned 20 percent increase in production. Not only does the company have a $100 million facility under construction, it's also allocating funds to make this new facility "as ‘green' as it can be." Said a company executive, "We're very proactive in conservation and recycling, including plastics, clean water and water reclamation - any conservation that works to help the economy and the ecology. We're conscious of the fact that resources are in short supply, and we take every effort to recycle, reuse and generate awareness of the limited nature of our resources." Fewer than expected were impacted even indirectly by the hurricanes, floods and tornadoes tormenting the U.S. last year. All told, 14 percent were directly affected and 26 percent indirectly. Still, once burned - or drenched - twice shy: Manufacturers who are hoping to avoid future disruptions of the "nature" nature, plan to divvy up production among their facilities, stockpile back-up supplies and engage secondary sourcing. "We are looking to expand alternative raw material sources. Disruptive weather primarily hurts our ability to procure raw materials," went one reply. One Connecticut processor is planning for future disaster: "[We are] reevaluating our data security systems and working with property management to ensure the safety of our on premise assets. Also, [planning] what to do in case we have to close up and relocate a large portion of these assets, and see how prepared are we to do that without losing too much money." A new question on the survey concerns recycling and other green issues. It was thus a pleasant surprise to learn almost two-thirds of manufacturers have some recycling program in place. In fact, another 17 percent claim to be "aggressively" recycling. Just over 8 percent aren't recycling yet, but plan to in 2006. So, how are those surveyed "going green?" Wastewater and other waste material reuse and recycling is popular. Along those lines was the processor who went beyond end use to "making sure byproducts are recyclable." Another creative answer was "putting plants throughout the company." Not a bad idea. Some plants, such as English Ivy, can clean up to 94 percent of the pollutants from ambient air. Reduction of hazardous production and cleaning materials and practices also came into play, as did packaging redesigns. Help is out there for those wanting to become more environmentally responsible. One wise suggestion we received recommended "working with governing bodies and consultants to take advantage of incentive programs offered by PUD [the public utilities district] and gas suppliers." Keeping workers and production safe and secure is important, as is just plain keeping workers. Some good news on the labor front this year is that only 5 percent of manufacturers polled plan to cut jobs. Another 12 percent will simply not replace lost workers in 2006, and 44 percent are standing pat. For those seeking jobs, 28 percent of manufacturers are adding to their workforce. "[There is] a shortage of people who want to work in this industry because of the long hours and average pay," complained a processor of fruits and vegetables in Arkansas. Although finding workers in general seemed to be an echoing concern, the need for skilled labor in supporting services wasn't ignored. "Finding qualified maintenance mechanics and electricians to handle increasingly sophisticated lines without extensive training," was the labor need expressed by a Massachusetts candy manufacturer. "Generally, we believe talent is available within the industry, it's just that not all companies will tap into it," said Grant Thornton's Maurer. "Companies will need to look harder and smarter to find employees, particularly management level, and that involves comprehensive recruiting, interviewing and pre-hire training programs. Additionally, this industry, like all others, will continue to look for greater levels of productivity from the existing workforce - a given in today's cost-competitive climate - and that will only come via strong workforce training and education programs." All in all, the outlook for the food industry looks good for the coming year, and we look forward to having this prediction confirmed in our next survey. We had a fantastic response to this year's survey and wish to thank all who contributed. Your insight into the shape of things to come in food and beverage manufacturing is invaluable.